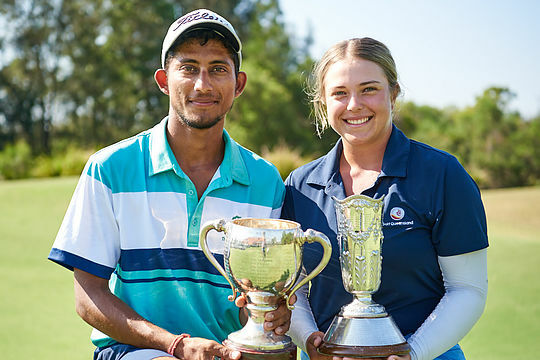 Queenslander Lisa Edgar and India’s Kartik Sharma have taken the Women’s and Men’s NSW Amateur Championship last Friday at Terrey Hills Golf and Country Club in Sydney. Edgar outlasted Grace Kim for a 2&1 victory, with Sharma fending off a determined Nathan Barbieri, 2&1, after Barbieri was at one stage 5 down in the 36 hole final before mounting a mini comeback. Barbieri closed out the finishing stages of the match like a bull in a china shop, claiming the 32nd par 5 hole after Sharma made a mess of his approach and then birdied the next, Terry Hill’s par 3, 15th to move to 1 down with three to play. Both players had pars on the par 5 16th after Sharma sprayed his tee shot and Barbieri was not able to take advantage of a birdie possibility after two solid shots, to be one down with two holes to play. As is usual at the Terry Hills layout, the 402 metre, par 4 17th provides plenty of drama and in this spirited final there certainly was plenty. After Kartik played a solid five iron second shot to the middle of the green, Barbieri hit a flyer from the right rough which flew the green, ending just a metre from being out of bounds over near the 18th tee. A delicate chip to within 2 metres of the hole gave Barbieri some hope before Kartik rolled his third to within a metre of the hole to set up victory. Leaving nothing short, Barbieri attempted to apply the pressure yet his par putt was too strong lipping out and then Kartik rolled in his par for the title. “It was a super tough match,” said Kartik, who with the victory will be exempt for the NSW Open. For Barbieri it was his second final appearance in two weeks having finished runner-up at the Australian Amateur to Ireland’s Conor Purcell and now another runner-up finish to Kartik and it was evident Barbieri and his team were disappointed with the outcome. Yet Barbieri’s efforts are to be commended. He’s played impressive golf to see him make the two finals where many others have faded. The Women’s final was also a classic match play contest with Queensland’s Lisa Edgar out early to have a commanding six hole lead over Grace Kim. Yet Kim put on a display of gritty golf clawing her way back over the second 18 hole to narrow the difference to just one. Again it was the 17th hole that produced the outcome and when Kim lipped out for par, Edgar had an easy tap-in putt for the title. “I was able to get up early in the match which gave me the confidence to keep it going,” said Edgar.